“God doesn’t expect me to be thankful FOR all circumstance, but IN all circumstances. There’s a huge difference. The first attitude is masochism. The second shows maturity.” California mega-church pastor Rick Warren, writing in Time magazine about thankfulness during what he called “the worst year of my life” after his youngest son committed suicide. This is exactly how our Savior wants us to be, thankful in all things because He will make His strength show through your weakness regardless of the circumstances you may be experiencing. So, how is your life going? Have you had some hard things to deal with this year? Did you experience some pain and suffering at some point? Were you thankful for it? Most people are not thankful for it at all…mainly because it is usually so unpleasant that you can’t be thankful for it. I have wondered in my life, “Why would God want me to be thankful for suffering or pain in my life?” He does not ask us to be thankful for the suffering, as in the quote above, but IN the suffering. While you are in it, you are to be prayerful, staying near to Him so that He can strengthen you and help you through your troubles and your pain. God loves all of us, but He doesn’t like the pain and suffering that we have to endure in this life. He is not the author of it, Satan is. Mainly because he wants to cause as many problems in our life as possible so that we will blame God for them. Many people do blame God or rather a god for their trouble or their problems. Why do they do this? Because He is thought of as a god who punishes and causes pain and suffering, yet these are descriptions of the kind of being that Satan is and has always been. God is not like this at all. We, all of us, are special to God because He formed man out of the earth, in His image and placed the breath of Life in him. No other creature in all of Creation has that honor, not even the angels in Heaven. This sets us apart as the part of Creation that God wants to have fellowship with, now and forever. This life on Earth is just preparation for the extended part of your existence, into eternity. You are free to believe what you wish about God and eternity, but when your life here is over and eternity begins…where will you be? My memory brought up this quote from a movie recently and I thought I would use it to see what sort of reaction I might get: “You can’t handle the truth! !” Is this the way that many people see God’s Word, as a Truth that they don’t want to handle or just don’t want to believe? 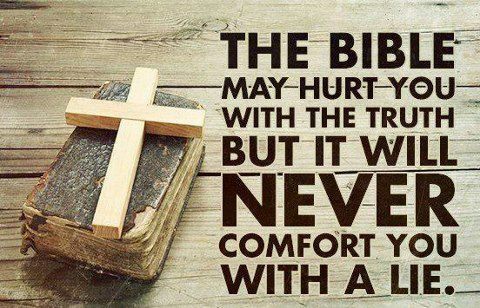 God’s Word and His Truth is hard for some people to swallow or it seems to be. It upsets people who are not Christians to see a cross or a Bible. Why is that? A cross is just a couple of pieces of wood and the Bible is considered “just a book”. The reason that many people have trouble with both of them is because of what and Who is represented by them. The cross is where Jesus gave His life for all of us and paid the price for our sins. If He had not done this, we would not have access to God or to salvation through His forgiveness. The Bible is not just a book but the Word of God given to His prophets, written down by them and by others who copied the Scriptures meticulously so that Israel would have a written record of their history and their covenant with God. It is verified by history and by archeology and the Promise which was repeated and brought into the world in the person of Jesus. He was foretold to be born in Genesis, spoken of by Isaiah and Ezekiel, and there was prophetic poetry written by David in the book of Psalms and all of these were hundreds of years before Jesus’ birth. The Truth contained in it will convict you if you haven’t accepted Jesus as your Savior but it also comforts and advises you in many different areas of life. Jesus can be your Savior and He is also your advocate, defending you from the accusations of Satan. The gospel message contained in it specifically refers to belief in Jesus and in His atoning death which opened the way for each of us to come before the throne of God, clothed in His righteousness. Jesus came to bring this to us, not only to His people but also to all of us gentiles outside of Israel. The Word of God is the most powerful and wonderful book that I have ever read. In some translations, like the newer ones, a child can easily understand it and the message that it contains. We are graced with the love of God through its pages and through our lives as we live out our lives in service to Him. Have you given your life to Him or maybe thought about it? Pray about it and read His Word. Ask Him to show you His Truth in its pages and passages. It is there and so is He, all that you have to do is look for it and accept the gospel as His message to you for your life. How far in the future do you make plans? I really don’t think that there is a way to truly make plans ahead of time. Many times people ask you questions like “What will you be doing five years down the road?” or “What about ten years down the road?” Can you really plan that far down the road in your life? What can we do about the direction that our lives take or rather, do we have real directions in our lives these days? Living in the moment, today, now is all that we have but we need to treat it as if it may be the last day. Why? Because we are not guaranteed tomorrow, let alone next week or next year. This bit of wisdom is found in God‘s Word and it is from Him, so it is the truth. It cannot be changed and no one can show that they know the future well enough to see exactly what they will be doing tomorrow or next year! Life is a gift for each of us, what happens to that gift is up to you. You can use it in a positive way and make a difference in other people’s lives or you can use it in a negative way and cause other people’s lives to implode because of something that you did or caused to happen. Each person on this planet has the capability to be or do many things, good or bad, each of us must choose the path that we will take. 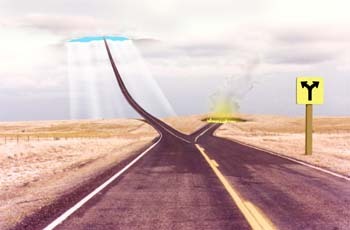 Some may say that their path has been chosen for them because of circumstances in their life. I don’t believe that your circumstances and your position or your parent’s position in life really has that much influence over your life. If you choose to make something out of yourself, you can. If you don’t decide to dream or to make a difference, then you won’t. The difference is your decision! Your decision also can make a difference in your life, not just here but in eternity too. Because it is your decision that will decide the direction that your life takes and the path that you ultimately follow. You don’t see your destination in this life, but after you take your last breath here, so which one are you on? Eternity is a long, long time so make the right choice while you can. I know that someone will have issues with my subject, but that is fine, as long as it gets you to thinking about your salvation and your relationship with Jesus. Today and in the past fifty years or so, people have pushed God out of their lives. Many are trying to forget God entirely. How can you do this? How is it even possible to forget Him? When a baby is born or you see a newborn puppy or a beautiful sunrise or any number of gloriously beautiful scenes on Earth, how can you possibly believe that God doesn’t exist? I know that some look at these things and say that they are just natural processes, part of nature itself and all of them were brought about by natural processes and that God has nothing to do with them. Really? I want to challenge you to read a few chapters in a book called Job in the Bible. The chapters begin with chapter 38 and go to 40. It is not much, but it is God speaking to Job, His righteous servant. As righteous as a man can be at least, but he was trying. Many people in our world and our society today don’t want to try. They just want to go to work, come home, drink a beer and watch some shows on the tube and go to bed and do it all over again tomorrow. Men have forgotten God. Why have they done that? Because they don’t want Him mucking up their lives or getting into their heads. They don’t want God anywhere near their children or in their life. But, God does want to be in your life and in your children’s lives because He loves you and He cares for you. It has nothing to do with power or money or greed, God owns it all and can create anything that He wishes to so why would He want what you have? Many people wonder why He would want a relationship with them? It is because each one of us is special to God because He designed us that way. Each person can do something for Him that nobody else can do and if they will come to know Him and follow Him, then they will find out what that something is. It may not be something which the world would recognize as great or stupendous, but God knows what you and I can do and that it is specific to each person. I am the only one that can write this blog, with these words. If someone else wrote it, it would be different. That is what I mean and what God needs from each of us…our individuality and our personality. Each person is specific in their own way, like our fingerprints, we are all different because He designed us that way. Think about it while you read those chapters in the book of Job, you’ll see and maybe He will help you to understand too!